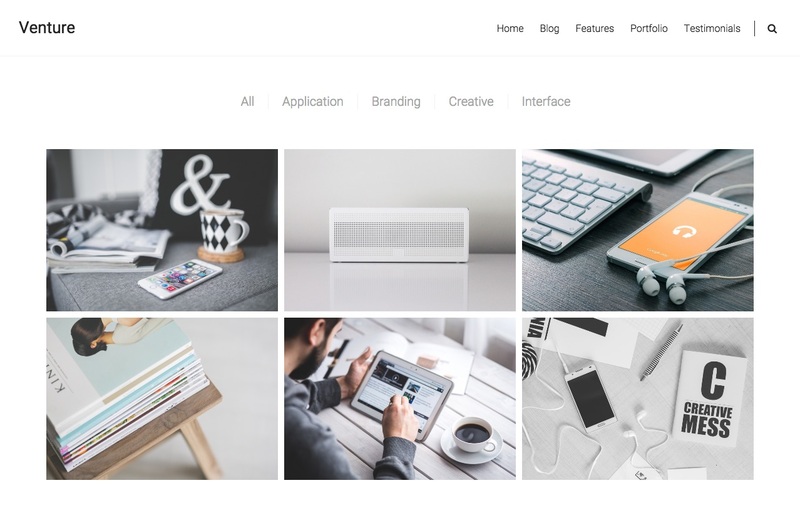 Venture is a simple, creative theme, perfect for designers, developers, photographers, and other professionals who wish to showcase their work. The theme pays close attention to typography, and its clean design offers a distraction-free reading experience. When you first activate Venture on a new site, your homepage displays posts in a traditional blog format. If you’d like to use the Front Page template instead, create or edit a page, assign it to the Front Page template, and then follow these steps to set as the site’s homepage. 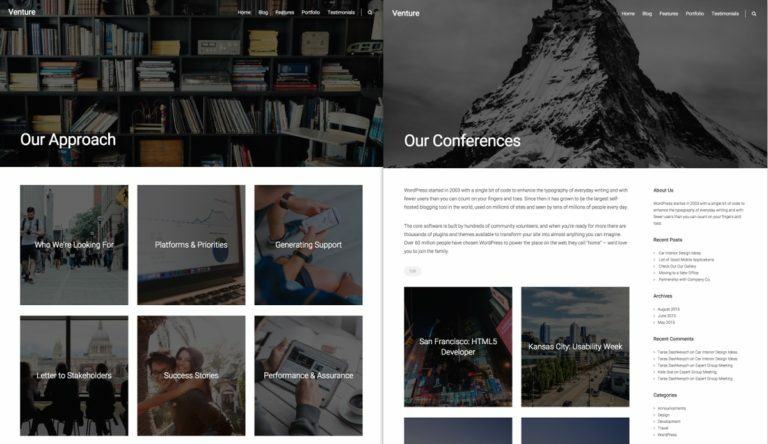 The Featured Content section on the Front Page template will display a slideshow of posts. These posts are selected by assigning them a specific tag of your choosing. In the Tag name field, add the tag you’ll use on posts to be displayed as Featured Content. For example, you could use the tag “featured” or “slideshow.” Click Save & Publish. Add this tag to the posts you want to display in the Featured Content slideshow. The post title will display, and the post’s Featured Image will be used for the background. By default, the slideshow will not show a link below the post titles (like the “Read More” in the screenshot above). To add a link like this, you can add a More Tag to your post content, and even customize the link text. If the Featured Content tag is not set, or if it’s not assigned to any posts, then the Featured Content section will display the front page’s title and Featured Image instead. This optional section can be used to display an introduction to your website. Add your introductory text to the content area. Be sure to update this page. If you opt to use the Featured Page section, you will be able to showcase one or more pages on your Front Page template. A single page can be displayed at full-width using the Regular Layout, or two or more pages can be displayed using the Grid Layout. The only page that cannot be selected as a Featured Page is the Blog Posts page, if your site has one. In the Customizer, go to Theme Options → Front Page Template: Featured Page. Under Featured Page, select a page from the dropdown list. The page you choose should not have any sub-pages (child pages). The Grid Layout allows you to display multiple Featured Pages. This is done by selecting a page with sub-pages. The sub-pages will be displayed in a grid layout on the Front Page template. Under Featured Page, select the page from the dropdown list. To use the Grid Layout, the page you select must have sub-pages. The page you select will not be displayed in the grid, but all of its sub-pages will be. Under Section Layout, choose a two or three column layout for your grid. Each page in the Grid Layout will display the title and excerpt. By default, “Read More” will appear as the text for the button under the excerpt, but you can change it to any title you want by using the More Tag. 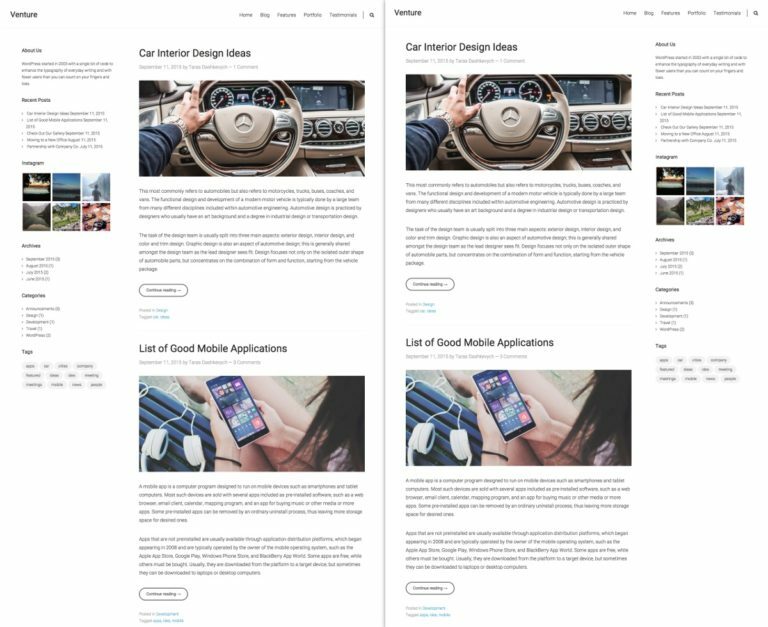 Recent Portfolio projects can be displayed on the Front Page Template, underneath an optional section title and text. In the Customizer, go to Theme Options → Front Page Template: Portfolio. To make the Portfolio section visible, check Display Portfolio Section. Under Section Title, enter a title for your portfolio section. Under Section Content, enter a brief content for your portfolio section. Specify how many projects you want to show in this section under Number of posts to show. 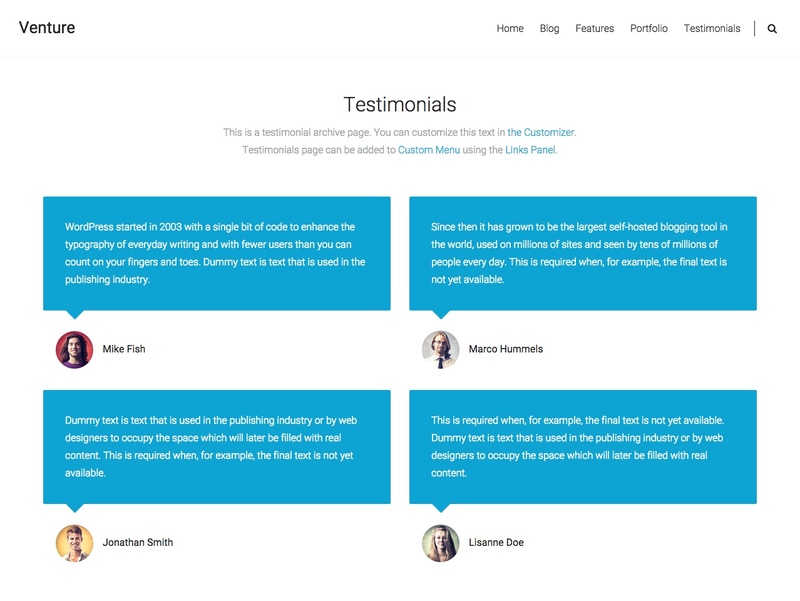 Up to five random testimonials can be displayed on the Front Page template. In the Customizer, go to Theme Options → Front Page Template: Testimonials. Check Display Testimonials. To display a photo with each Testimonial, add it as a Featured Image to each Testimonial post. You can also show your most recent blog posts on the Front Page template. In the Customizer, go to Theme Options → Front Page Template: Blog Posts. Check Display Recent Blog Posts. By default, this section displays the title “Recent News” above the posts. You can edit this by adding your own title into the Section Title text field. Under Section Content, you can enter some text to appear above the recent blog posts. Specify how many posts you want to show under Number of posts to show. Create or edit a page, assign it the Full Width Page template and click Publish. Create or edit a page, and assign it to the Grid Page template (or Full-Width Grid Page template). The Grid Page Templates will display all sub-pages of the current page in a grid. For the Grid Page template, it’s a two-column grid, and for the Full-Width Grid Page template, it’s a three-column grid. Each page displayed in the grid will use its Featured Image as a background, and display its page title on top. Primary menu — located in the header, next to your site title. Social menu — located at the bottom of your site in the footer. In the Customizer, go to Theme Options → General Options. Select the desired alignment from the Sidebar Position drop-down. With Venture, you can add testimonials easily by going to Testimonials → Add New in your dashboard. Testimonials are composed of the testimonial text, the name of the person, and an image (which can be added as a Featured Image). All testimonials are displayed in an automatically generated testimonial archive page. The testimonial archive page can be found on your site at http://yoursite.com/testimonial/ (replace http://yoursite.com/ with your own site URL). Venture automatically enables the Portfolio feature, offering you a clean and a beautiful layout for your projects. All portfolio items are displayed in an automatically generated portfolio archive page. The portfolio archive page can be found on your site at http://yoursite.com/portfolio/ (replace http://yoursite.com/ with your own site URL).